There is really no exact answer to the question of the best time to visit any tourist place; because it will be different for everyone. It will heavily depend on factors like what a person’s preference is; how they were traveling and for how many days; and if there was any budget constraint at all. With that being said, there is a period of time when every tourist destination receives majority of its annual tourist footfall; and that period usually gets called as the best time to visit there. Same rule applies for best time to visit Chopta as well. Usually the months of May, June and September get considered as best time to spend a few days in Chopta. But will that be best for you too? Read on to find out. For a brief introduction, Chopta is a small region of meadows and evergreen forest area which is a part of Kedarnath wildlife sanctuary in Uttarakhand. It is located at a distance of 29 kilometers from Ukhimath, 162 kilometers from Rishikesh and about 450 kilometers from Delhi. Located at a height of 2,680 meters; and surrounded by forests of pine, Deodar and rhododendron; it is a very scenic and offbeat place that is still not touched and spoiled by tourist mania. The small lake of Deoria Tal is located quite close; which too is a popular trekking and camping destination; and attracts tourists throughout the year. So when is the best time to visit Chopta? Let me first give an overview of how the place looks in every season; and then I will talk about how the weather trends month by month; and what the average temperature remains to be. I will also include details on what you should be packing depending on your month of travel. Chopta is one of those destinations that remain charming throughout the year. It presents a different color in each season and can be visited round the year. In summer, the weather here remains mostly pleasant; and the light cool breeze adds charm to the overall experience and vacation. During monsoon, rains bring a carpet of green that covers the meadows and the hills, making them a sight for sore eyes. This is the time when when the entire region comes to life with flora and fauna. Come winter and all that was green turns white. A blanket of snow engulfs the entire region making it look like mini Switzerland, which Chopta is often referred to as. So if it was snow that you were after and hoping to catch a live snowfall; then you should plan a visit here in the months of January till March. If you wanted to witness the magic of spring in the meadows of Chopta; then traveling in the months of April and early May will be best. For someone wanting to see lush green valleys; rich with flowers blooming of numerous types and colors; and white clouds floating by; traveling in July, August or September would be best. Monsoon however also brings a risk of landslides caused by non-stop rains; causing roads to blocks for several days sometimes. If you wanted see the magic of autumn and the orange color in the trees; then you should plan your trip in the month of October. November is not generally considered a good time because the weather gets too cold; and the vistas turn dull and dry. Winter settles in by December and if you went towards end of the month, there is a high chance that you may catch a live snowfall. 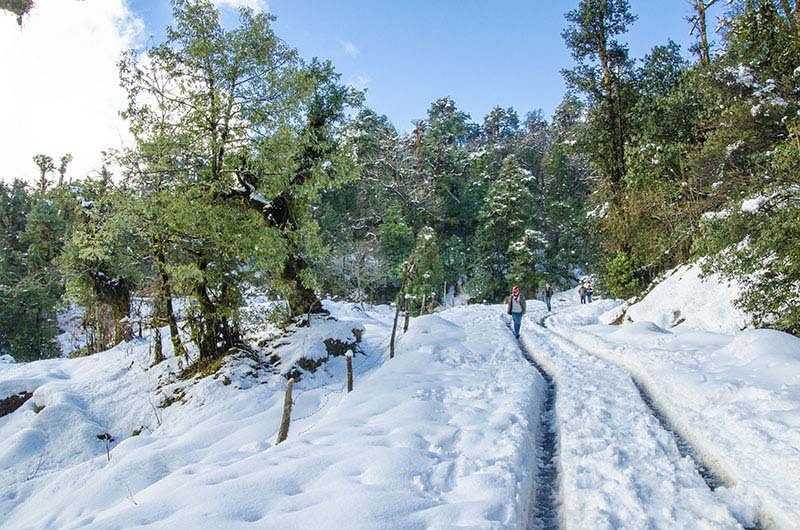 The temperature in Chopta ranges from a freezing cold at -10 Degrees Celsius in winter; to a pleasant and moderately warm 25 Degrees in June. Weather is usually the dominant factor that drives the best time to visit any place and the same rule applies for Chopta as well. Due to the pleasant weather, majority of the people arrive here in May and June. Below is how this tiny hamlets looks in different months of the year. Chopta remains covered in snow during the month of January. Intensity of snowfall can be from moderate to heavy; and sometimes enough to even block the road for a few kilometers. Driving to Chopta too is a challenge in itself at this time due to slippery and snow covered road. Usually the road gets blocked for a few kilometers before Chopta. You can bring your car for as far as you can, and then will have to trek as far as you can. Or you can rent a 4×4 Gypsy in Ukhimath and have them drive you till the point where the road gets closed. For planning a trip at this time, you must bring heavy woolens and a pair of snow boots. Average temperature at this time will be a minimum of -10 Degrees Celsius at night and 8 Degrees Celsius during the day. The condition and the temperature in February mostly remains the same as January. The only difference is that the amount of the snow on the road will be even more in February. All the snowfall so far in the season would have resulted in several feet of snow getting accumulated on the ground. Road to Chopta usually remains blocked in the month of February. If visiting at this time, I will recommend making a trip to Deoria Tal instead because reaching Chopta may not be an option really. Weather will continue to remain very cold; with temperature ranging between -5 Degrees at night and 15 Degrees Celsius during day. Most of the Dhabas and hotels remain closed at this time; hence it is strongly advised that you call in advance and inquire about your stay. The road too may remain closed in earlier part of March if there was snow on the road. It however becomes a favorable month for people planning a winter trek. If you are planning of doing some walking and trekking in the snow then bringing a good pair of snow boots is strongly advised. Spring arrives in April and weather starts to turn pleasant. It is a good time to visit Chopta. Average night temperature will go up to around 3 degrees Celsius and average day temperature will be around 15 degrees. Days will be clear and pleasant but nights will still be very cold. Sometimes the temperature may go even below 0 so please pack clothes accordingly. Views of snow capped peaks at this time however definitely makes the trip worth it. May and the following month of June are usually considered as the best time to visit Chopta. Snow would all have melted away and temperature will range between 4 Degrees to 20 Degrees Celsius. Days will be clear, pleasant and moderately warm. You must however still carry light woolens because it will still get a bit cold during night. It is also the best time to do Tungnath and Chandrashila trek. June is another great month to plan a visit to Chopta. Average temperature at night will rise up to a minimum of around 6 to 7 Degrees Celsius. Days too will turn warmer at 25 Degrees Celsius maximum. Carrying light woolens is still advised at this time. Towards the middle and end of the month, Chopta and the nearby region may receive some rain so please be prepared. Remember the floods of Kedarnath in Uttarakhand? That happened in the month of June. July is when Monsoon arrives in the region but it can rain in June as well. By July, monsoon is in full swing. This entire region receives a high amount of rainfall each year and it can sometimes turn catastrophic as well. Before planning a trip either in July or August, please check weather conditions and forecast. If it rained non-stop, it can keep you trapped indoors for the entire duration of your trip. Landslides caused by rain are common in this area; and can sometimes keep the roads blocked for days altogether. Temperature in July will range between 5 Degrees minimum at night to 25 Degrees maximum during day. Temperature in August remains to be the same as in July. I know I mentioned a word of caution about visiting in monsoon; but it also happens to be my own personal favorite time to be in the hills. With all the water pouring down, this is the time when the hills and the valleys truly come alive. A lush green carpet covers the mountains and flowers of different kind and colors start to bloom all around. If you have even slightest of interest in photography, this is the time you would want to be in Chopta. If you asked me, I will name September as the best time to plan a trip to Chopta. If you want all that monsoon has to offer without having to encounter monsoon then you should go in September. Rains will mostly be all gone but the green and the beauty will remain. Valleys will still be colorful with green meadows, blooming flowers and dense forests; presenting a sight to behold. Days will remain pleasant at around 20 Degrees Celsius; but temperature at nights will start to drop close to 5 Degrees. Autumn arrives in October and all that was green now turns Orange. Average temperature at night will drop down to 0 Degrees Celsius. Days will be a mix of cloudy and sunny with an enjoyable kind of cold at 20 degrees. With all the golden color in the trees, this month too is good if you are into photography. It is also a good time for a trek to Tungnath and Chandrashila peaks; and for other outdoor activities in Chopta. This in my opinion is the least favorable month to visit Chopta. Weather will get very cold with nights freezing at -5 Degrees. Day temperature will average out at 15 Degrees but you will definitely feel the chill in the wind. Vistas will turn dry and dull and there won’t even be any snow around. By December, winter would have arrived and settled in. The views will start to turn to those of snow again. Temperature will range between -5 Degrees to 10 Degrees Celsius. If you went towards the end of the month, chances are that you may even catch a live snowfall. Considering all the information above; the months of April, May, June and September would be the best time to visit Chopta. If a winter trek was on your mind ten February and March will serve good. I hope the information above was of help. If you have any questions; or need any further details; please feel free to ask in the comments section below; or at our Community Forum; and I will be glad to answer.